Despite changes in the law, and suggestions that enforcement using cameras was due to begin in the spring of this year, a spokesman confirmed that the company is still waiting for Home Office type approval for the use of camera equipment to issue automatic fines for offenders. 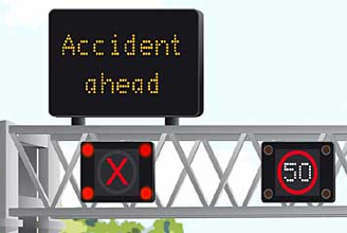 A report for Highways England into the all lane running smart motorway between junctions 5 and 7 of the M25 found that up to one in five drivers failed to comply with the use of red X’s to close a lane in the year to April 2017, with non-compliance ranging from 0 to 14 vehicles per minute (0% to 20%). The report, which covers the third year of the scheme’s operation, found that compliance with Red X as a percentage of total flow was 94%, which was no better than the previous year and only slightly better than the 93% in the first year. A parallel report into the scheme between junctions 23 and 27 of the motorway similarly found that compliance as a percentage of total flow was 94%, ‘a slight worsening’ from the 96% in the previous year but ‘a slight improvement’ on the 93% the first year. The danger posed by high levels of non-compliance with Red X’s was highlighted in a 2016 report from the Commons Transport Committee, after which the Department for Transport (DfT) said it was ‘actively considering the case for automated enforcement via technology, which will require legislation to amend the Road Traffic Offenders Act’. The Government amended the Act last year to allow ignoring Red X’s and driving on the hard shoulder to be added to the list of offences for which records from prescribed devices such as automatic number plate recognition cameras can be used as evidence in proceedings. However the relevant technology has not been approved and a DfT spokesperson declined to state when type approval would be granted. Highways England said that since 2016 it had been working hard to tackle compliance issues through campaigns to assist in the understanding of a Red X and had issued over 130,000 warning letters to drivers who had either used sections of hard shoulder when not designated as a running lane or had failed to comply with a red X symbol. Steve Gooding, director of the RAC Foundation, said: ‘Too many drivers who wouldn't think of running a red traffic light still seem to treat the Red X as an advisory rather than a mandatory signal, used to protect their safety.